Shire Oak Quarries Limited prefers to withdraw planning application rather than submit legally-required environmental impact assessment (EIA) for Dean Quarry. CADS PLANNING WITHDRAWAL PRESS RELEASE 26.2.2016. To see a copy of planning withdrawal letter sent from Shire Oak Quarries Limited to Cornwall Council Click Here. 9.6.2015 Secretary of State for communities and local government overturns Cornwall Council decision to re-open Dean Quarry. This decision was received on the same day that Amber Rudd, Secretary of State for Energy and Climate Change gave the green light on planning permission to build the world’s first tidal lagoon power station in Swansea Bay. Shire Oak held a series of ‘open days’ at the quarry during the week commencing 20th April 2015 for anyone who wished to attend. No information was provided about these until the 20th April, despite Shire Oaks publically stated wish to have an open and close relationship with the community. Several members of the community and CADS attended to voice the views of the community. Attendance by representatives of Shire Oak was variable on each day, with no representatives present on the first open day. CADS team made a successful representation to the Cornwall County Council planning committee on the first stage application in the steps to reopen the quarry. Significant support was received from Councillors involved in the decision making process with the planning being based only on a 7:6 majority, following an amendment to the appellation by Councillor Tim Andrewes. For the full story please click here – Press release on planning meeting 7 April 2015. 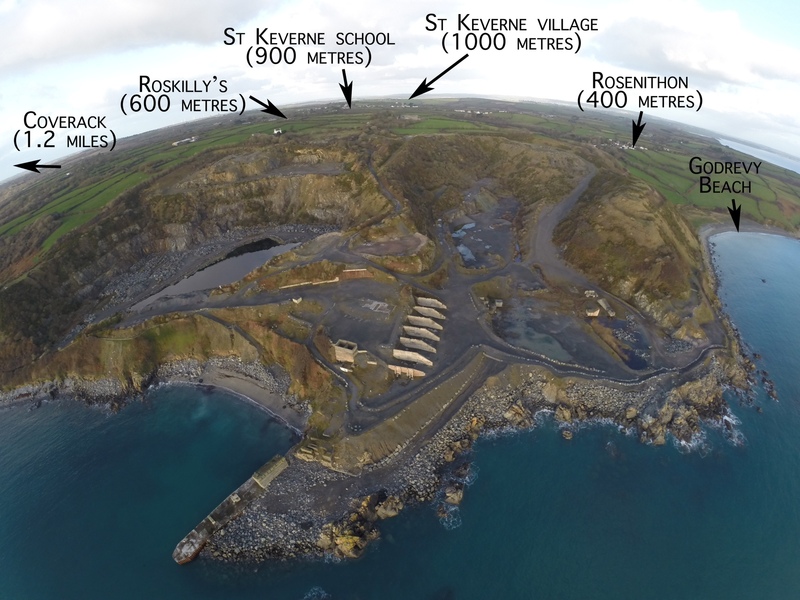 We are delighted to announce that St Keverne Parish Council have rejected the planning application for the buildings that would facilitate the re-opening of Dean Quarry. It will now go to Planning Committee at Cornwall County Council in early April. Shire Oak Quarries commitment to good relations with the community already seem to have gone by the board. As of this morning they have started scrub clearing and removing wildlife habitats on site. This is in advance of the planning consent for the buildings and despite a request from the Parish Council for an independent ecological survey.